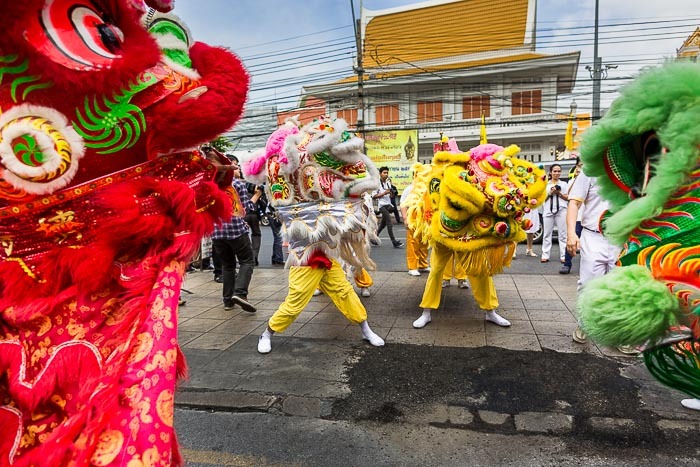 Lion dancers perform during the Vegetarian Festival parade in Bangkok's Chinatown. It's Vegetarian Festival time in Thailand. 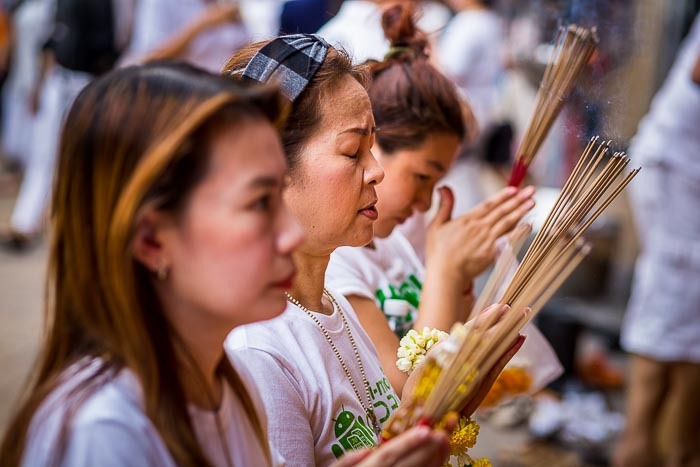 The Vegetarian Festival is the Thai celebration of the Taoist Nine Emperor Gods Festival. The festival starts on the eve of the 9th Lunar month and lasts for nine days. In Bangkok, vendors line Yaowarat Road, the main street in Chinatown, and sell vegetarian food, lots of desserts but also noodle soups and main meals. The food is excellent and innovative. Traditional Thai favorites, like pork with holy basil and chilies, are widely available only with tofu subbing in for the pork (or chicken or fish or pick your protein). A child marches in the Vegetarian Festival parade. 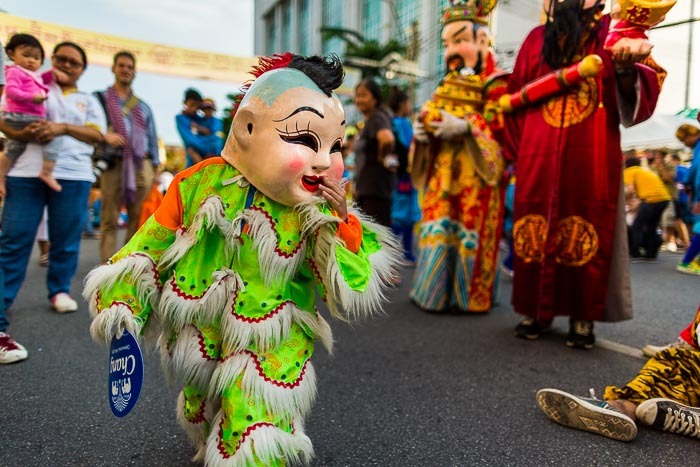 The festival kicked off with a parade down Yaowarat Road Wednesday afternoon. Before the parade started people, dressed in white to show piety, came to Chinese temples and shrines and prayed and made merit. Prayers at the Thian Fah shrine near Odean Circle in Chinatown. This year we get a special treat: two vegetarian festivals. This is a Chinese Leap Month, there have been 13 new moons since the winter solstice, so for the first time since 1832 we get to repeat the first part of the month. Hence, two vegetarian festivals. 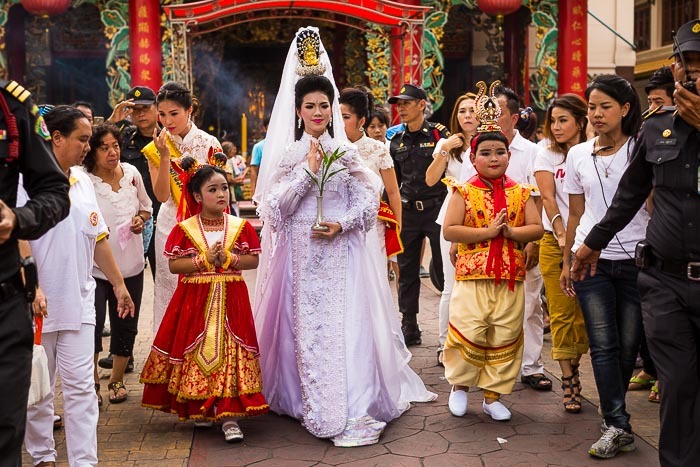 A woman portraying the Goddess of Mercy leads a procession before the parade. There are more photos of the parade in my archive or available from ZUMA Press.